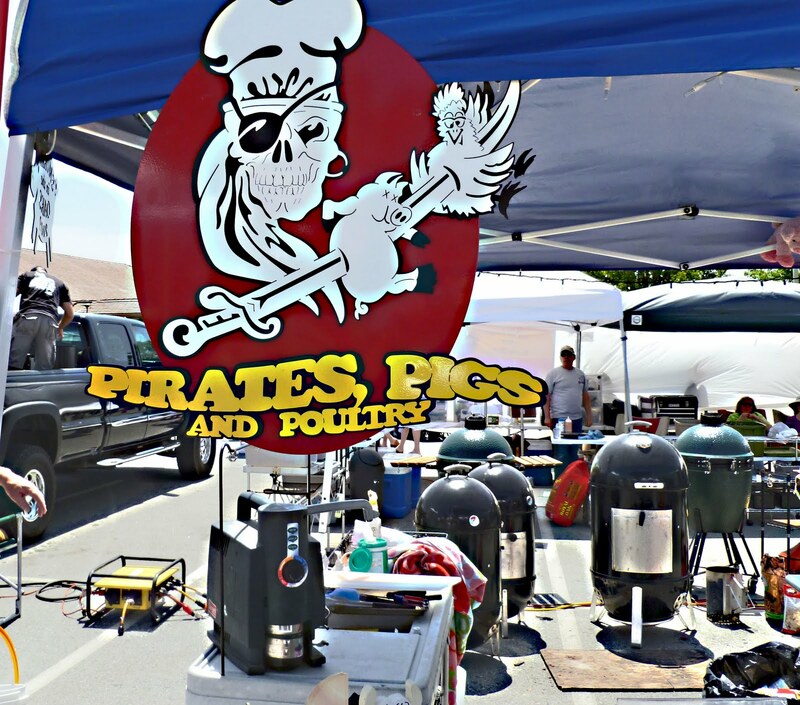 An eleven pound pork belly is soaking in a marinade of 'Love.' This a nitrate free bath of salt, apple juice, sugar and molasses. That is all she wrote. "The Great White Hunter" has commissioned me to make a nitrate free slab of bacon. This brine will work its magic for three days and a hot smoke stoked with Hickory wood will transform this piece of swine to a magical treat. Stay tuned! 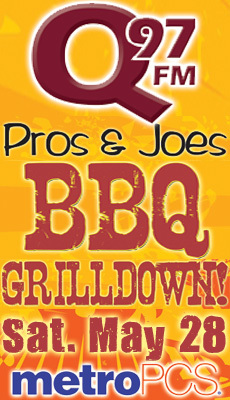 Mother Nature smiled on the Pros & Joes Grilldown event this Saturday. She held back on the thunder and downpour of rain until after this barbeque meat extravaganza. 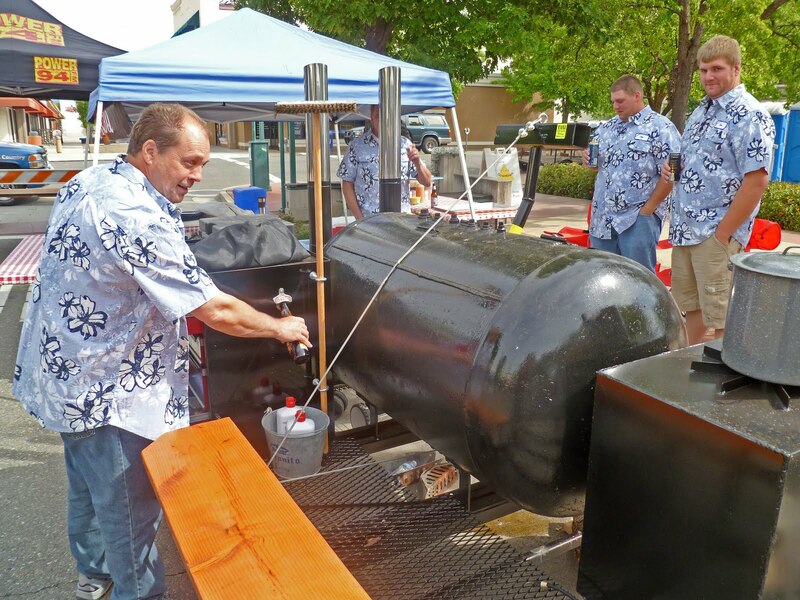 The skies were overcast but that did not dissuade 1,300 hungry and thirsty Redding residents from attending. This was a contest that pitted professional cookers versus the backyard grilling enthusiasts. Boy was there enthusiasm among the ranks of cookers. The crowd was treated to many different grilled and smoked food items. 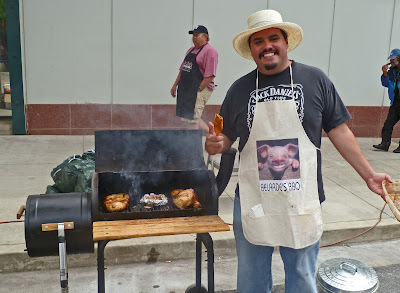 The hungry public traveled booth to booth sampling foods from whole cooked Hog to jalapeno poppers. Once they have had there fill, they voted on the ’Peoples Choice award.’ Ribs, chicken and tri-tip was the meat prepared for the judges. Our judging duty was very difficult to pick out the best out of so many tasty entries. “The Billys” band provided music to create a festive atmosphere.There was a lot of full and happy people. The results were tallied and the winners were declared. I need this option on my rig! This is a fun local event. Ms. Goofy’s sister Shastina judged for the second time.and now has the BBQ bug. 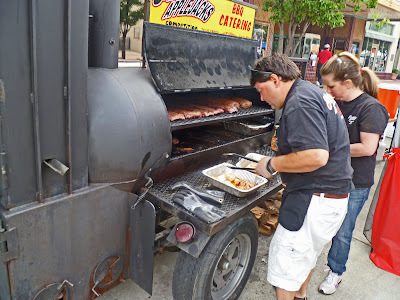 I am sure she will become a certified KCBS judge in the near future. 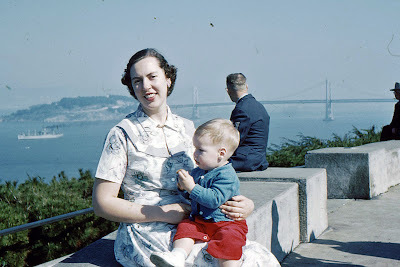 Speaking of certifiable, My Bro-In-Law John is considering letting me drive his Harley around the Shasta Dam. Today might be the day. 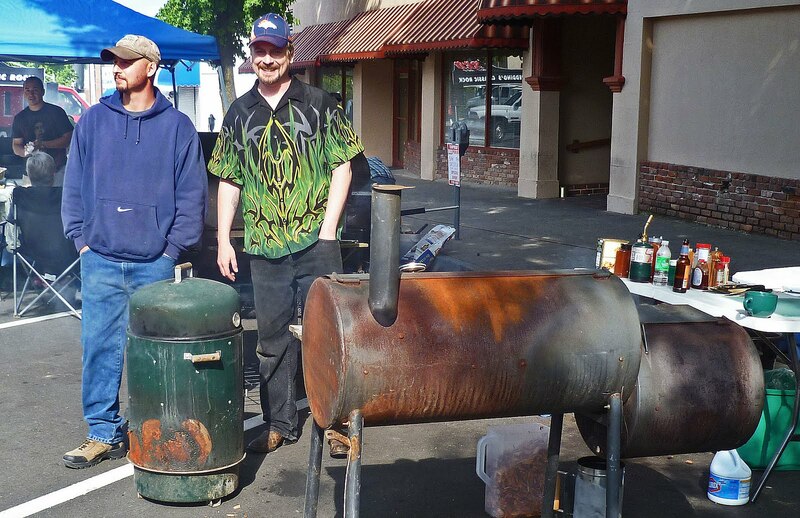 This Saturday May 28, in downtown Redding California will be a fun barbeque event. 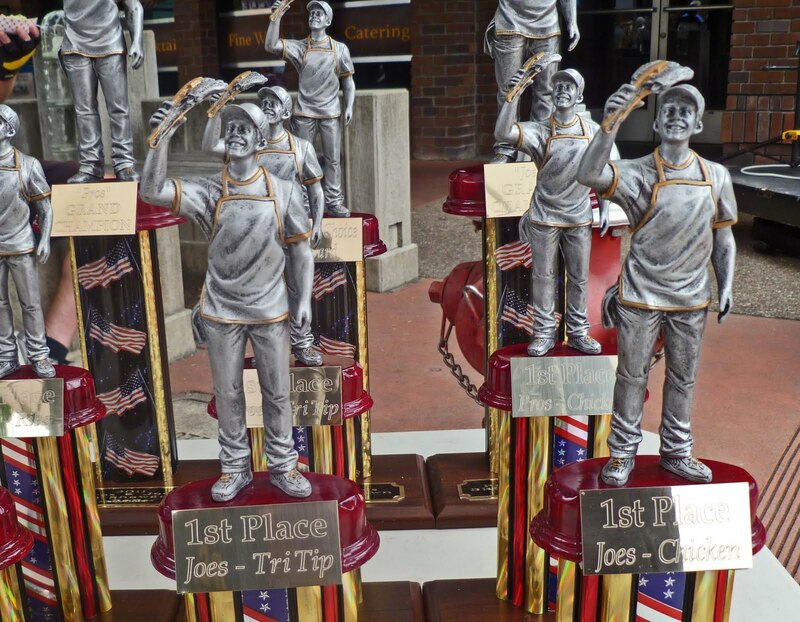 It is the battle of the 'Pros & Joes'. The Pros being local restaurants and catering companies versus the Joes, backyard barbeque enthusiasts. Ms. Goofy and I will be in the Judges arena to referee this epic event. 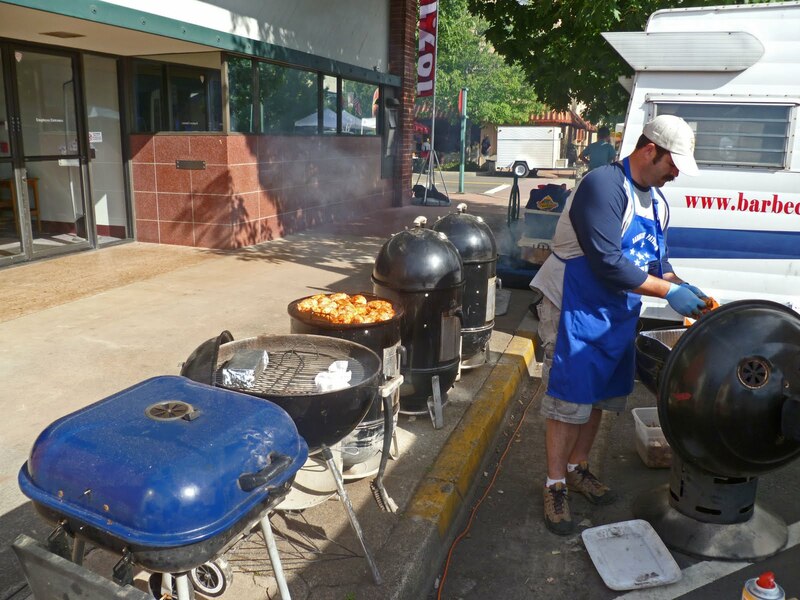 This is a great event for the public to taste some great BBQ. Hope to see you there. Here are some pictures from last year. It is the end of the world as we know it and Ms. Goofy and I are going out with a bang. 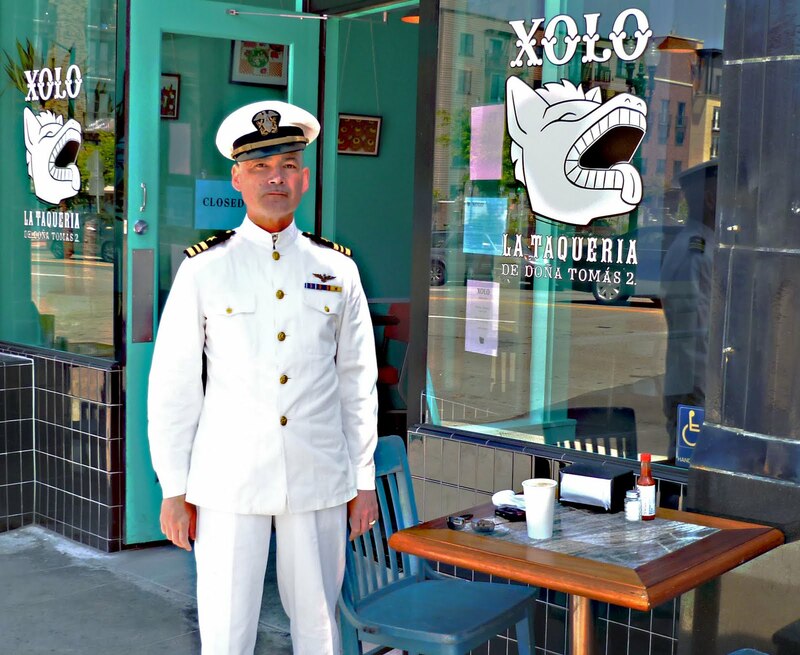 Danger Dogs were on our list of things to do and a trip to ‘Uptown Oakland’ to ‘Xolo’ would satisfy our wish. It has been a strange day. 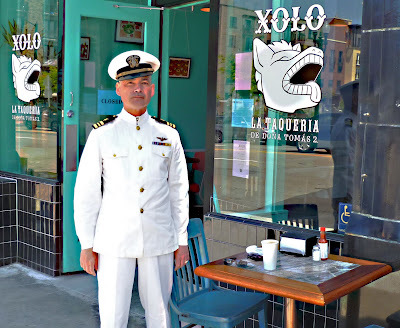 We arrived at Xolo and met this man in a clean pressed military uniform. He asked us if we knew were he could find an establishment of liquor consumption. We could not help him and I asked if he was on shore leave. He said no he was only an actor waiting to be picked up at a certain corner to go film a movie. Ms. Goofy ventured to guess that it was for an Adult movie. 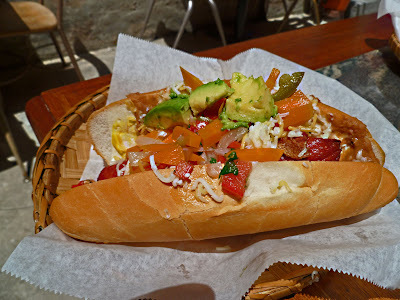 The ‘Danger Dog’ is a bacon wrapped hot dog, mayonnaise, mustard, pinto beans, cheese, pickled jalapenos, and avocado on a bollillo roll. It was a holy mess and I guess I deserve it on this final day. 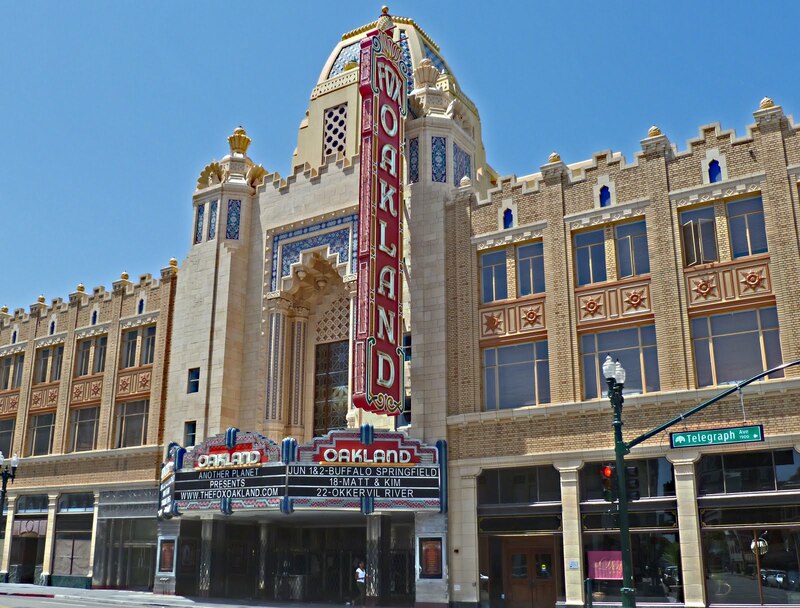 Xolo is located across from the newly renovated Fox Theater in Oakland. 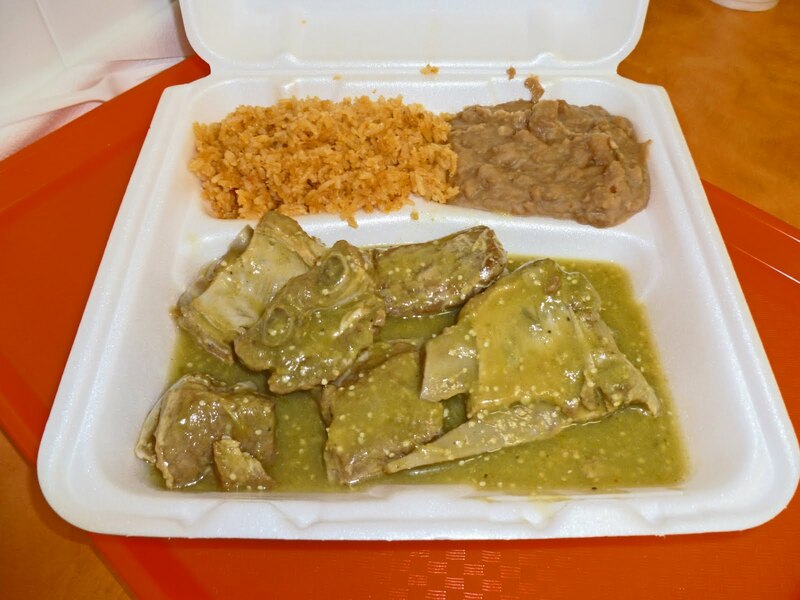 Chile Verde review to follow shortly. 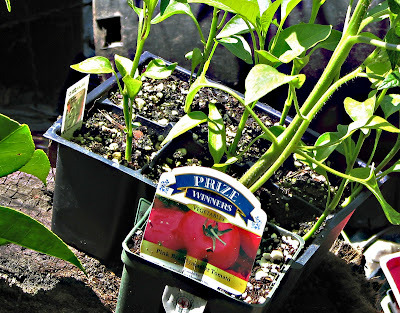 How ever you say it, it is time to get some ‘Gosh Darn Golly Wompers’ tomato plants in the ground. Mother Nature has been throwing us curveballs with her rain delays. We have made it to the fifth inning (month) and is time to play ball. A strange long trip to Bezerkley, to visit my favorite two nurseries for unique and fun tomato plants was in order. Last year, the ‘Julia Child’ tomato plant was purchased and transformed into a beautiful pink Brandywine type of tomato that we want to grow again. We arrived at the first nursery (which will remain nameless) and it was closed. Closed on Thursdays? 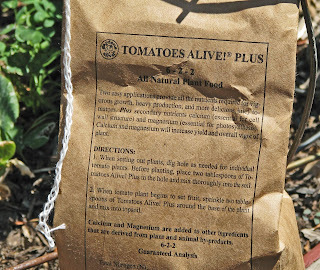 No problem we will just go to the next garden of our tomato delights. I was shocked and greeted with the same sign ‘Closed on Thursday’s’. Only in Berkeley are gardening establishments closed in the middle of the week. Conspiracy? 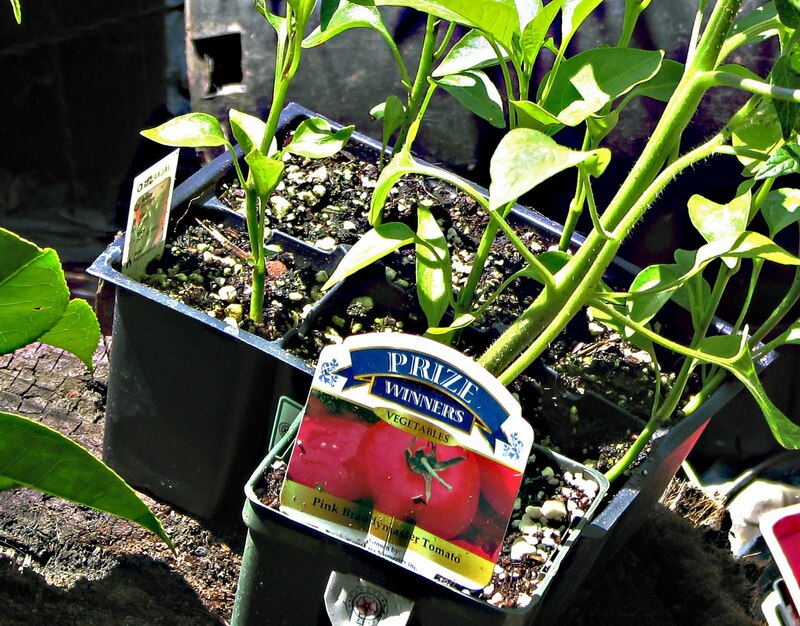 A large retail box store was settled for to purchase one ‘Brandywine’ tomato and a half dozen jalapeno plants. 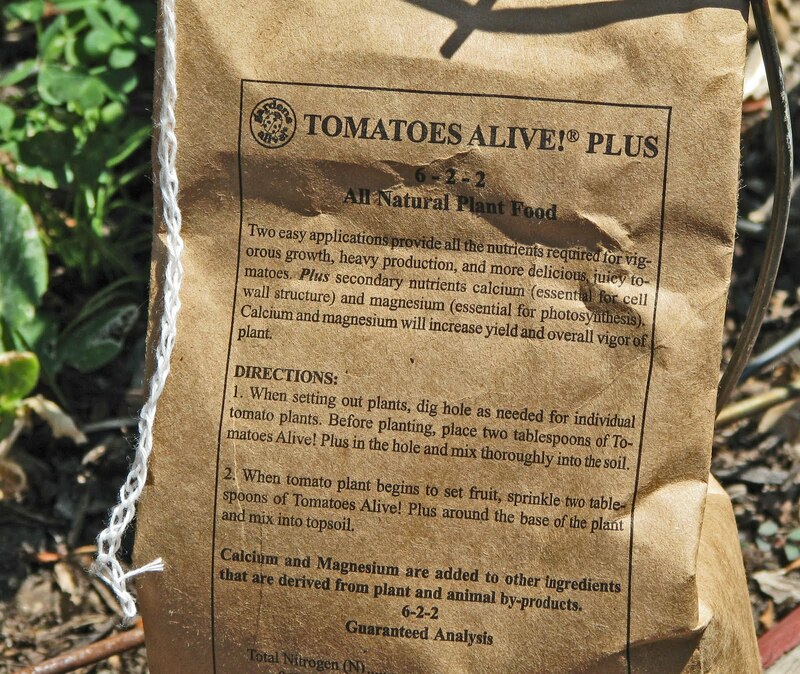 I am going to share my ultra secret growing tip for beautiful and tasty tomatos. A green thumb with a special fertilizer will help. ‘Gardens Alive’ sells a special mixed blend of organic material, minerals and special guano from a rare lisping ‘Quichomo Islands’ bat. Follow the directions and reap the awards for delicious tomatoes. The million dollar question is will something that is so healthy taste good? We soon shall see. 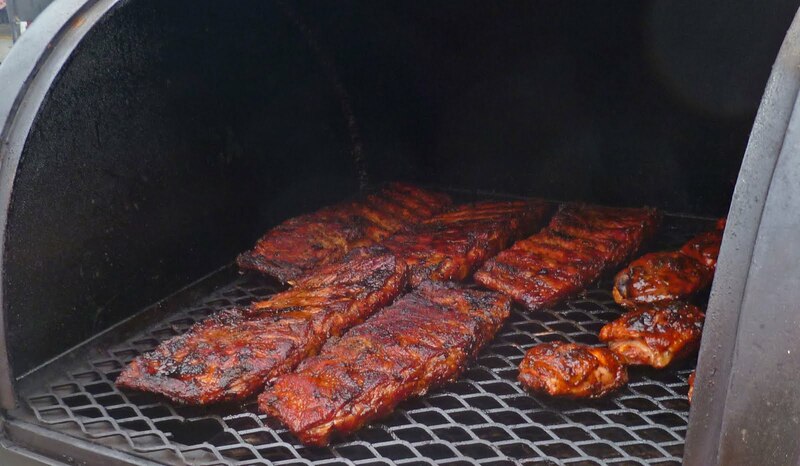 Today’s menu will consist of some chicken thighs and pork shoulder steaks that have been marinated in Five Star Meat Marinade for 24 hours and grilled. 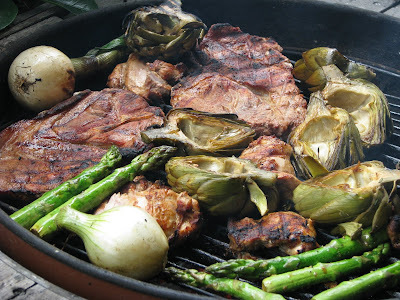 Today’s grill will also include some asparagus and artichokes. 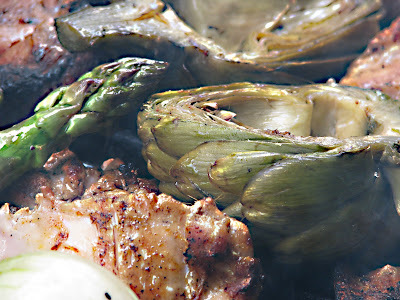 The artichokes were parboiled in salted and lemon infused water. 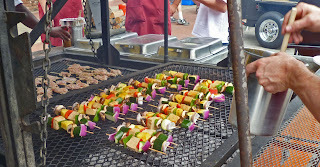 They were then sliced in half and marinated in garlic, olive oil and a splash of balsamic vinegar. 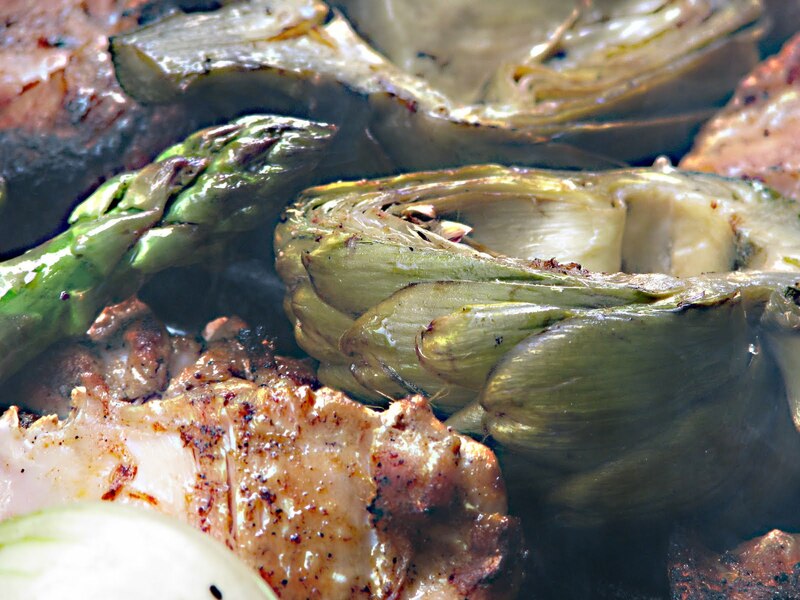 A smoking hot mesquite fire was our fuel to flavor and cook our proteins. The grill grate was given a healthy swab of oil to make sure nothing would stick and produce grill marks. This cook was fast and furious. 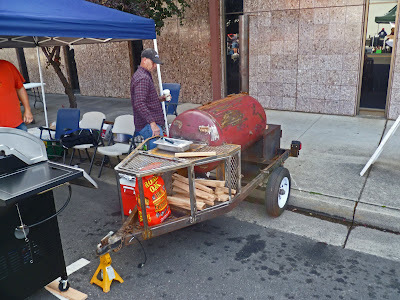 Smoke was bellowing and sparks were flying while our dinner was grilling. The end result was one good looking platter of grilled meat and vegetables. This was one tasty meal. I am going to refer you to Peppers and More for the results and the complete review. 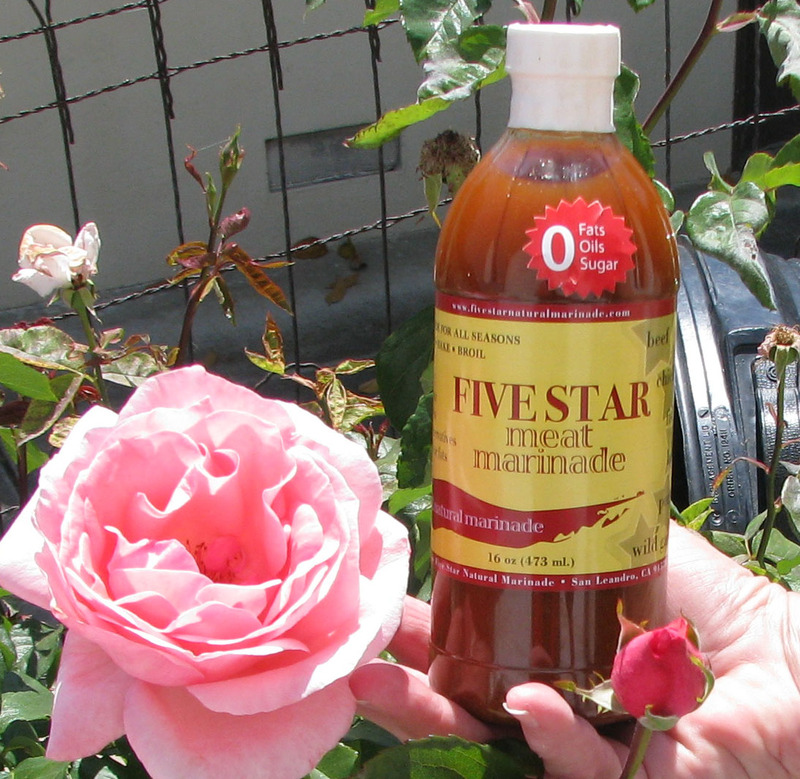 (Complete Review Here) Burt Amaral has his Five Star Marinade available by mail order. 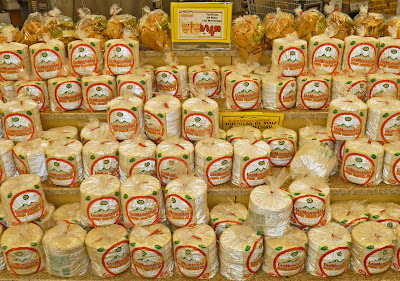 If you are located in the East Bay, Encinal Market in Alameda carries it. 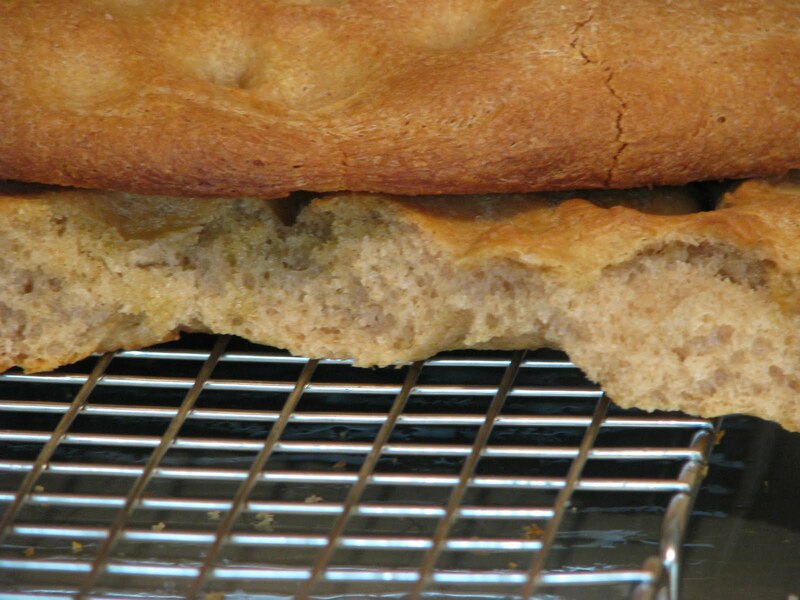 Simple ingredients make for a very special, tasty Italian style bread. 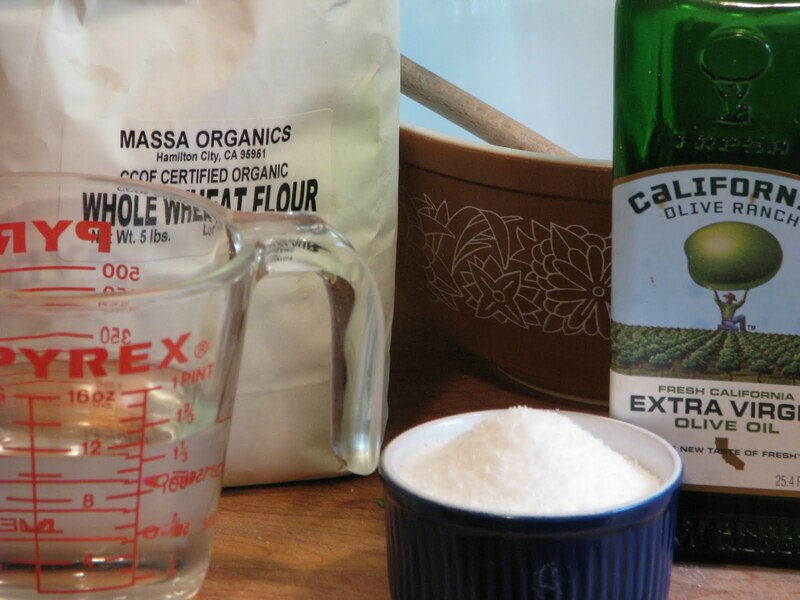 Combine ingredients and knead. 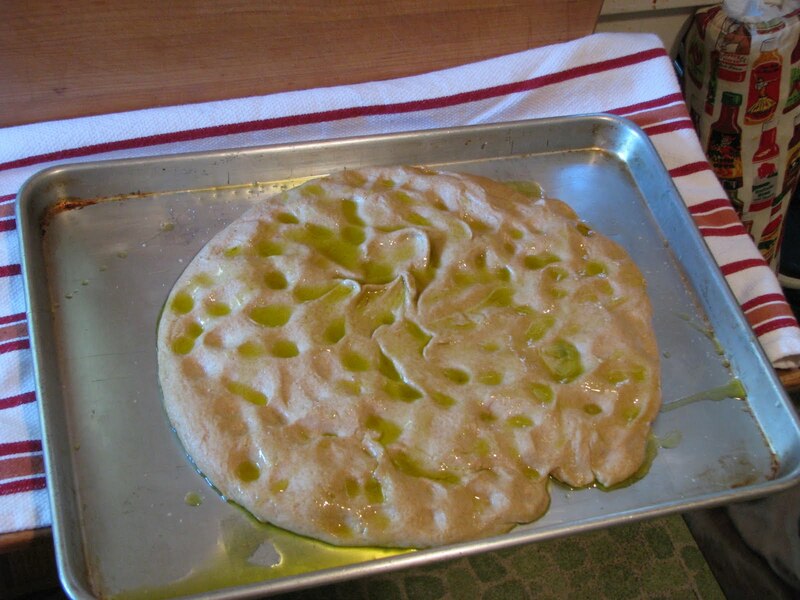 Let dough rise for an hour or two. Spread dough on to a baking sheet, flatten and dimple and pour remaining olive oil on to bread. Sprinkle with the slightest rain of salt. Let rise for 1/2 hour. 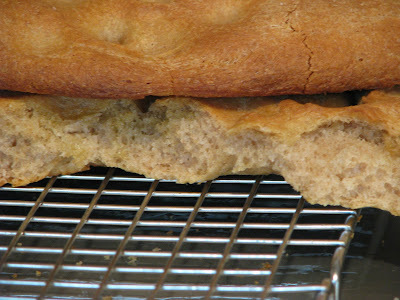 Bake at 400 degrees for approximately 35 minutes, or until the smell completely intoxicates you. 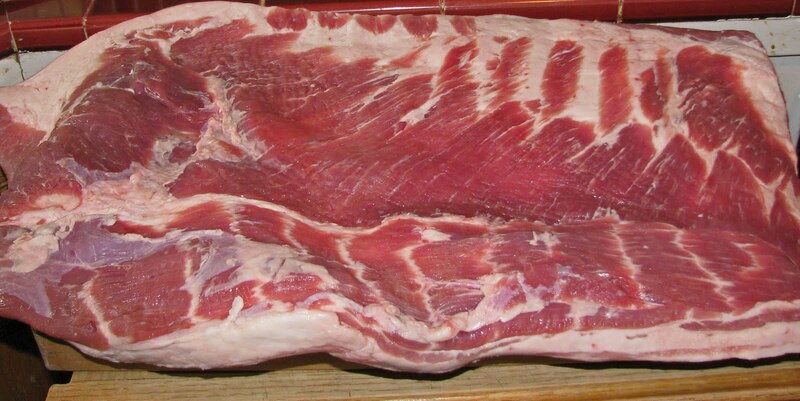 It is time to make some bacon. The cupboard is bare. This video inspires me to make some real home smoked bacon. 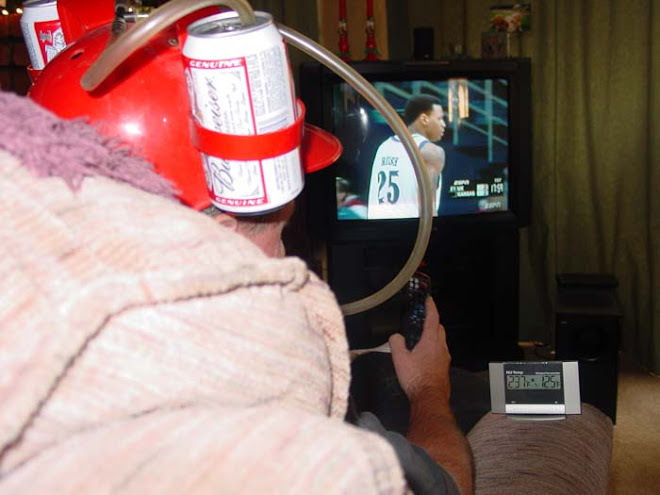 It is a tough job but somebody has to do it. 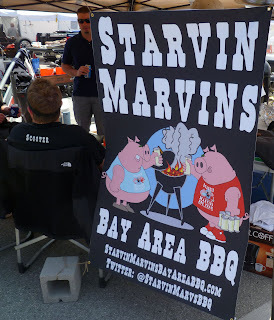 There were 65 barbeque teams that traveled to Morgan Hill California to do the competition dance at the ‘Morgan Hill No Bull BBQ Cookoff this last Saturday. A lot of time, money, smoke and pride were involved. These teams would stay up all night cooking brisket and pork shoulder. The next morning ribs and chicken would be prepared in hopes of convincing the judges to give them high scores. The three amigos; Ms. Goofy, Reverend Biggles and I donned our judge’s badges and rolled into town to taste and score some of the best BBQ in the nation. I always enjoy seeing all of the different bbq cooking rigs. 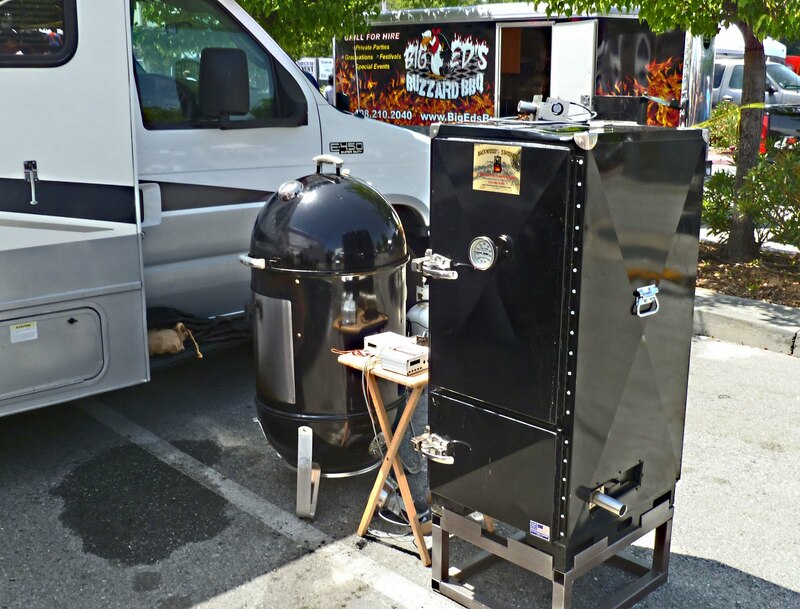 The Weber Smoky Mountain cooker is the most popular cooking vessel with the Green Egg as a close second. 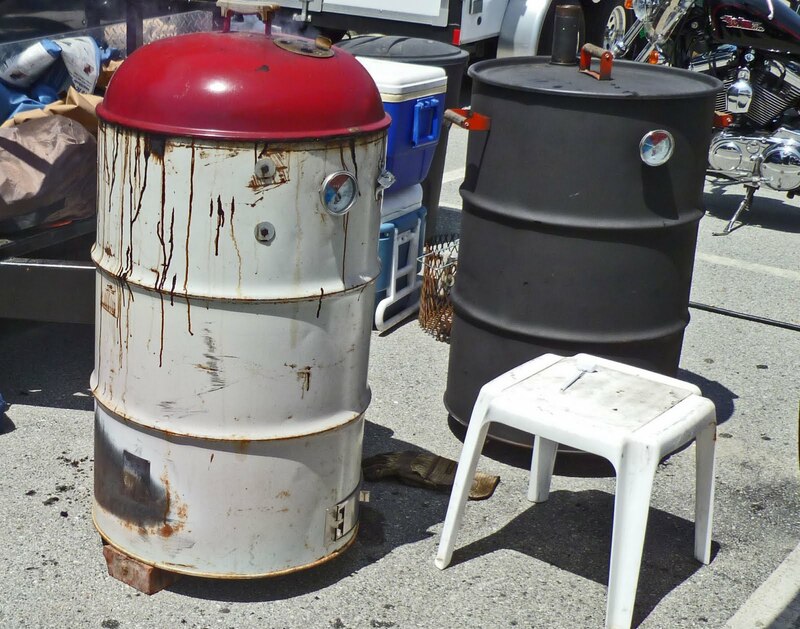 You will see all types and styles from a recycled 50 gallon barrel to a custom built and painted rig that is attached to a trailer. Christmas may be 7 months away but Ms. Goofy must be getting all sorts of ideas. There was a good showing of Morgan Hill residents attending this festive event. They were able to purchase tickets to taste and vote on delicious smoked and barbequed meats prepared by the competitors. Their votes would be tabulated at the end of the day and a ‘Peoples Choice’ award would be determined. 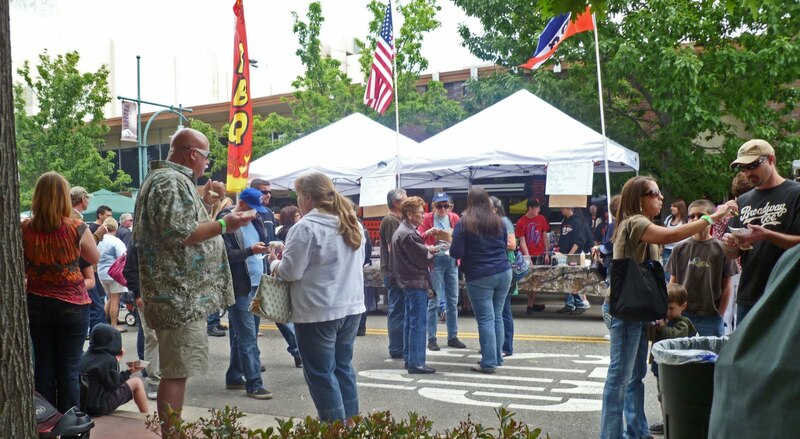 Music groups and craft vendors entertained the public as they strolled and ate their way through the event. We missed most of the music because we had a serious job to do. We were hunkered down in the judging hall stuffing our faces and marking our scores. Harry Soo of ‘Slap Yo Daddy BBQ’ team was victorious as the overall Grand Champion. 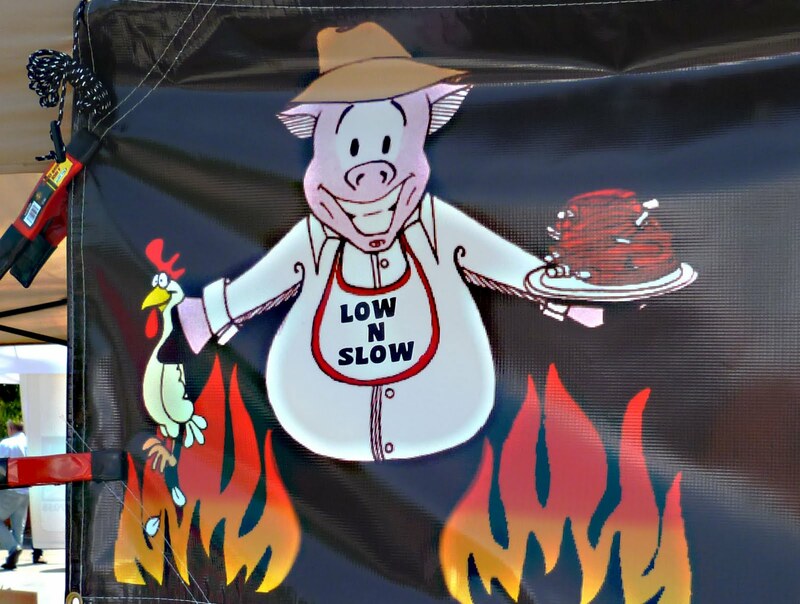 Our friend Donna of ‘Butcher Daughter BBQ’ is a rookie, competing in her first year of competition. 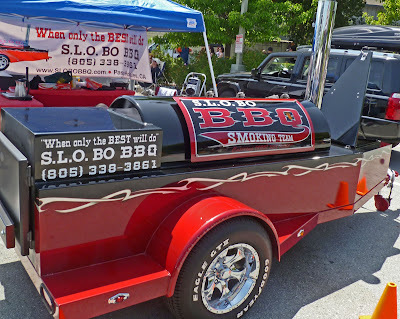 When you win an award there is a bbq slang term that you are; “Taking the Walk”. Well Donna Fong got to ‘Take the Walk”. 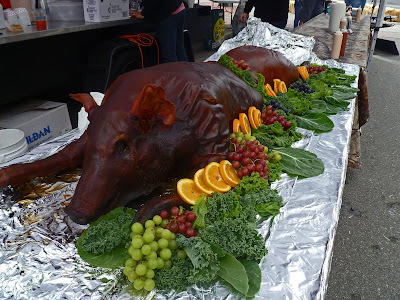 She took third place in the pork category. We are so proud. She also placed 16 out of 65 in the overall scores. Congratulation to all the competitors for making this a wonderful and successful event. I love you Mom! Today is a celebration for you. 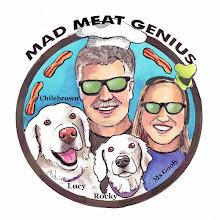 How did I ever sit up straight with that massive Mad Meat Genius Cranium? You are the best and I just want to say I love You!!!!!! Cinco de Mayo is a holiday of celebration of Mexican heritage and pride. 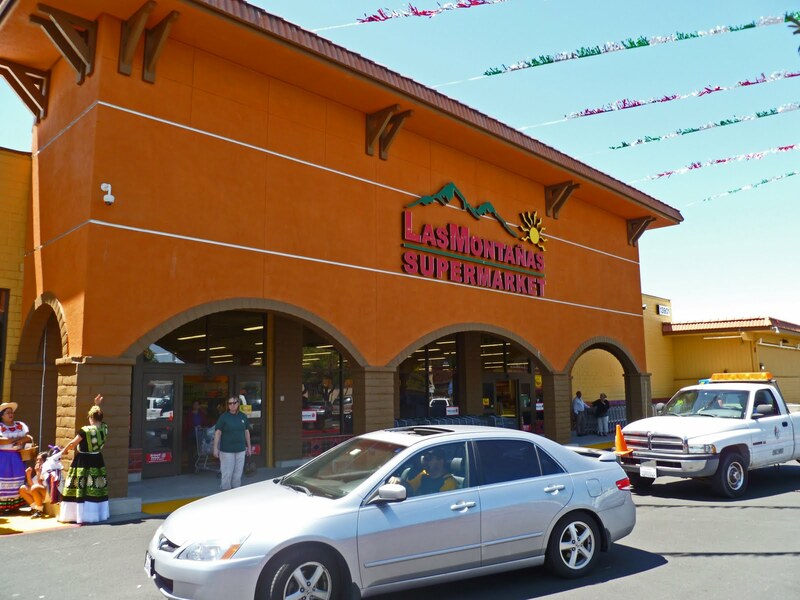 In honor of this holiday we are going to take a tour of a new supermarket in San Pablo California called ‘Las Montanas’. This is a one stop Mexican “Wally-Mart.” One can not stop by Las Montanas and not be impressed by its huge and vast selection of Mexican food items. 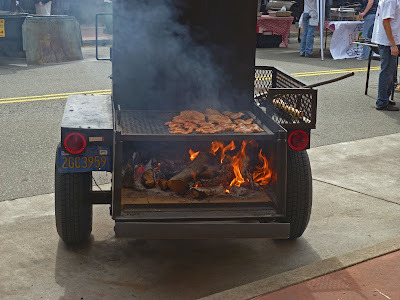 Just driving into the parking lot you are greeted by smells of barbequed chicken that is being cooked on the outdoor grill. Let’s go inside. 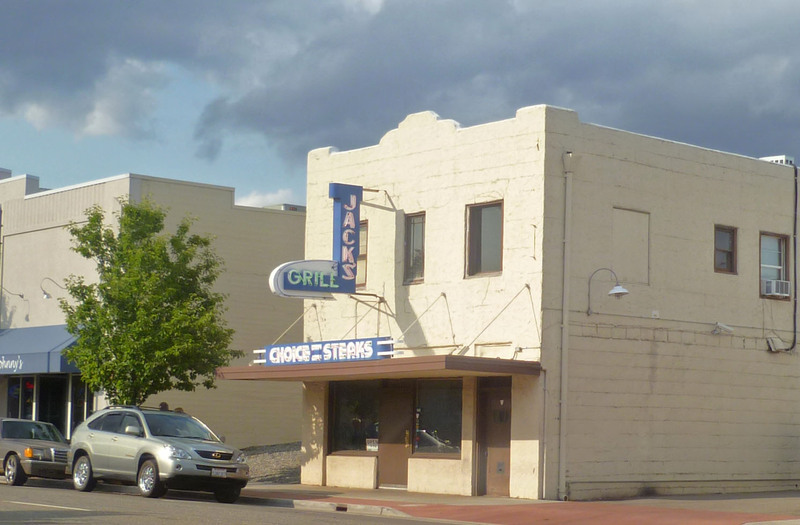 Las Montana’s occupies the old ‘Yard Birds’ and is a cavernous building. The store is divided into different food section stations. The produce section is huge and well stocked. This is a wonderful place to stock up on chilis and herbs for your Mexican dishes. There is a meat section that has your various cuts of meats which a lot are marinated. 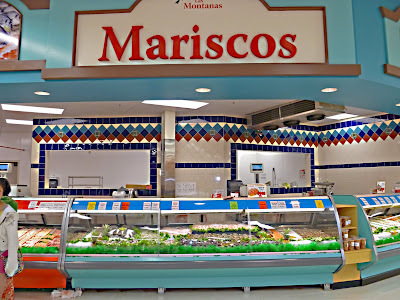 There is a separate seafood section that stocks fresh mariscos. 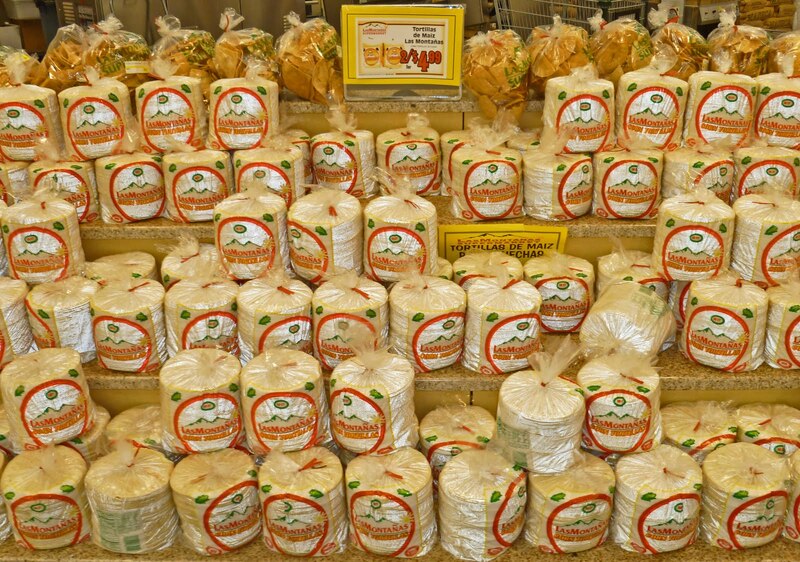 The tortilla section has a machine that cranks out freshly cooked discs of masa. You will not be able to pass up these warm tortillas. 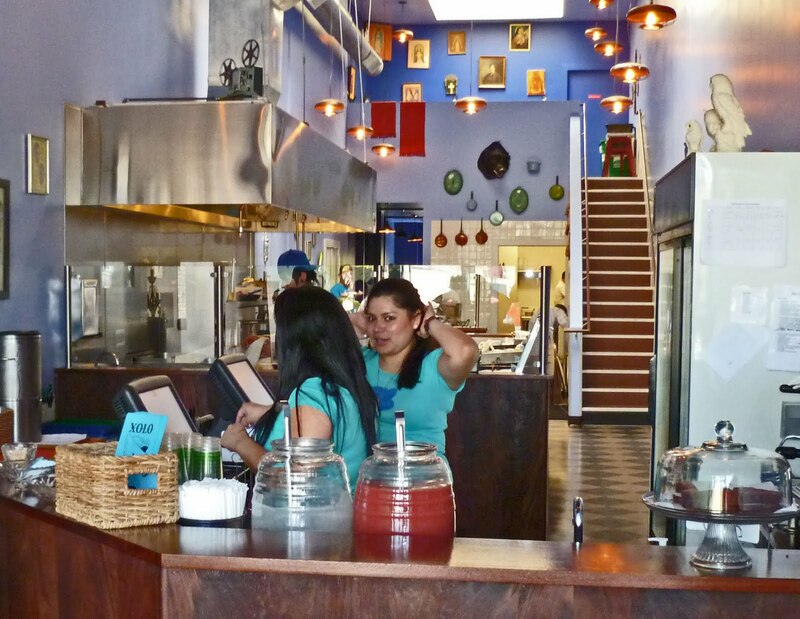 Right next door is a selection of Mexican pastries and desserts. I will return to try some of those caramel apples. After all this shopping you might need some nourishment. There is a station that makes fresh fruit drinks and it is located right next to the in store taqueria. 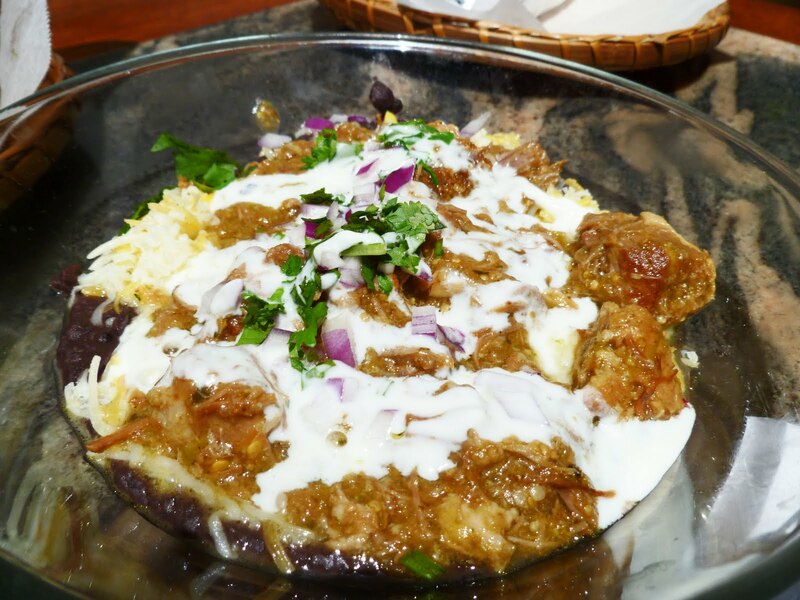 What the heck, lets try some Chile Verde. This plate of pork ribs in a green tomatilla style sauce was very inexpensive priced just under five dollars. It was on the salty side for my taste. 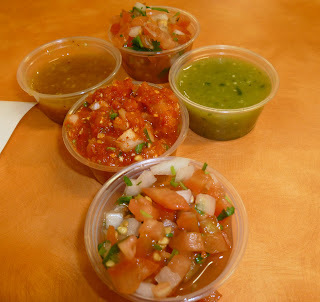 What was nice was the salsa bar which you can load up on various sauces. 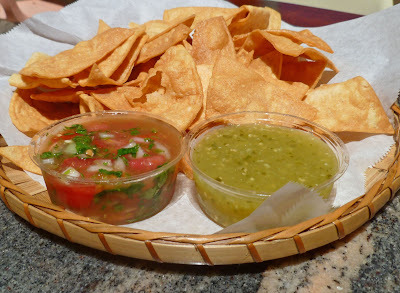 The tortillas were very fresh and combining the salsas, meat, beans and rice made for one tasty meal. 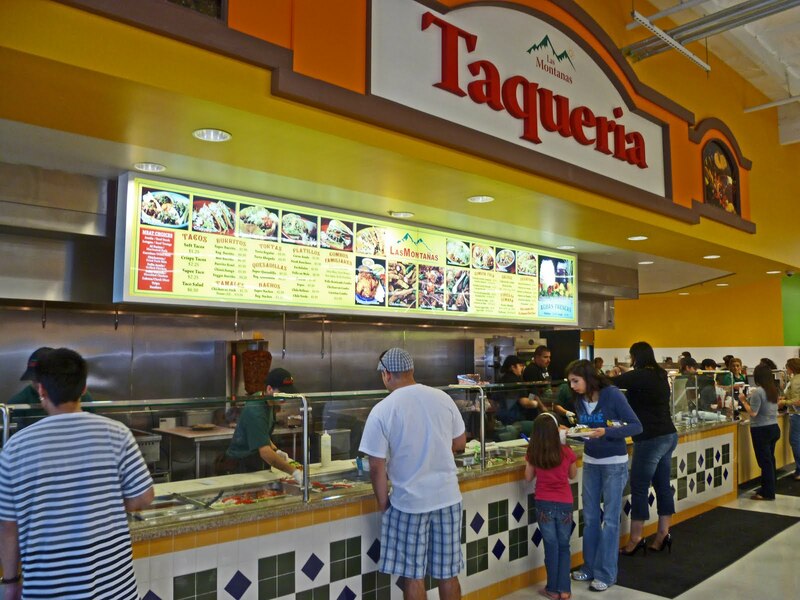 Las Montana’s has all these wonderful Mexican food stations. They also stock all other food staples and grocery items. 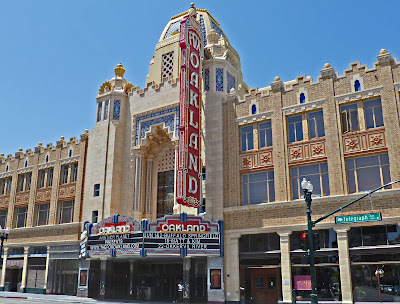 This is a wonderful addition to the neighborhood. Some of the local ‘Mom & Pop” stores may not be so enamored with Las Montana’s. Las Montana’s is large and has very low prices. We will definitely return to take advantage of the freshness and variety of the various Mexican food items. I will return just to try the caramel apples. 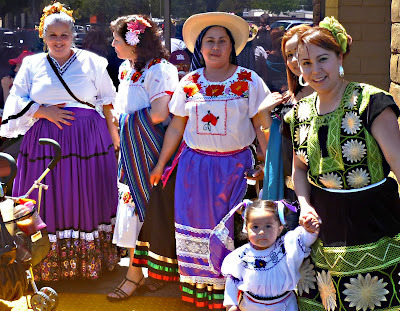 Happy Cinco de Mayo!